Joseph Hodge acknowledges applause as he takes the stage for the first time April 13 as Manchester Symphony Orchestra’s new music director. Hodge will make his official debut on Saturday, June 8, at Manchester Symphony’s annual Pops concert. But, the “Enigma Variations,” already on the program for the April concert, were a unique opportunity to present the orchestra’s final choice from among 52 applicants from all over the world. 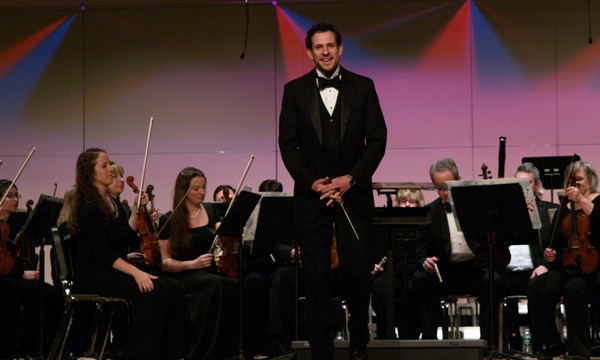 A graduate of Hartt School and the University of Virginia, Hodge is currently serving as music director of the Hartford Opera Theater and the Connecticut Valley Chamber Orchestra. Both Hodge and Mack will again appear on the podium at Manchester Symphony’s June 8 Pops concert with full orchestra and chorale, A Night at the Theatre, as part of Manchester Arts and Heritage Week in June. Manchester Symphony invites singers of all voice parts who can attend the Monday evening rehearsals to participate.